I was tagged by the absolutely gorgeous Ella from In Ella's Element to do the Summer Bucket List Tag. I adore Ella's blog, it's one I have to read every time she puts a new post up so I would highly recommend going and checking her out! Rainbow from Rainbow-Rose Blossom - I'd love to see what she has planned for the rest of the Summer! Marianne from Don't Burst My Bubble - she is such a positive and inspirational person, I want to hear about what she gets up to! Liz from Lipstick & Confetti - Liz is so adorable and she always has fun posts on her blog so I would love to see her do this tag! Natalie from Intrepid Bliss - Natalie has such a creative blog, I'm interested to see what she has planned for the rest of her Summer! Chelsea from Olive & Ivy - I have been crushing on her blog lately and I totally want to see what she's got mapped out for the rest of her Summer! I know so many of my gorgeous blogger friends have already done Summer bucket lists (at the beginning of the Summer, imagine that!) so I really tried to pick people who haven't done a post on this! I would love to see anyone else's list that did this post/tag, just leave me the link below! What do you guys have planned for the rest of your Summer? Great ideas, Kim! Thanks so much for the nomination, I'll post mine tomorrow! I would like to do every single one of your bucket list! Summer is slipping away! Can you believe Saturday is August? My husband and I are having a date day Saturday and maybe I can cross a couple of these off the list!! Have a most wonderful Thursday sweet -n- pretty friend of mine!!! Aw you're bucket list is so lovely Kim I love having dinner outdoors! Such a great post you lovely lady! The sunset bike ride is a great idea! 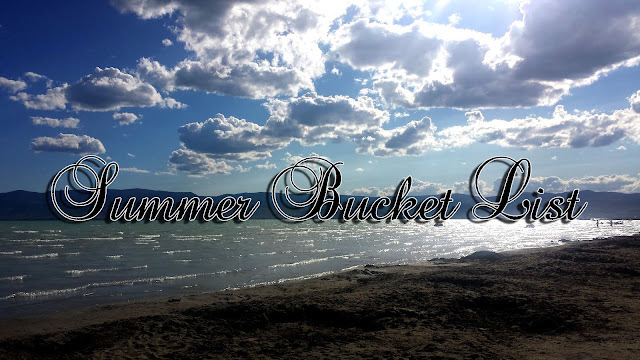 I also think I would like to do everything on your summer bucket list! I love the idea of having dinners outside and watching the sunset. Unfortunately, it seems like summer is flying by so quickly! outdoor dinners! oh so dreamy! love summer time! Aw thanks for tagging me! I definitely want to do more hikes before summer is over, and GO CAMPING! I haven't been yet because my boyfriend has been working pretty much every day this summer, but we may be going tomorrow night so fingers crossed! I so should have done this at the beginning of summer! Still a few weeks left!